Chinese spring green teas are categorized by four seasonal designations indicating which time in the spring the tea was picked and manufactured. The earlier the tea is plucked the smaller the yield of that tea will be and the more expensive the tea will be. The earliest plucked teas are the most desirable for sweetness and delicacy, and the fever for these teas is high in China as well as in the West. Chinese spring green teas are only plucked once a year in their designated harvesting seasons. Pre-Qing Ming tea: 1st Spring Harvesting Season from end of March to before April 5th. Pre-Qing Ming teas are the first teas plucked each new spring season. Depending on the location and altitude in each tea-producing region, leaf plucking can begin as early as the middle week of March and continue until April 5th. Pre-Qing Ming teas command the highest prices because the demand for these teas outpaces the supply each spring. This is especially true for Famous Teas such as Gan Lu, Long Ding, Longjing, Lu Shan, Tai Ping Hou Kui, and Zhu Ye Qing. In the tea factory, during the processing for yellow tea the fresh buds are removed from the heat at a point when they are moist and warm. The buds are covered with a cloth in a smothering step ( men huan or ‘sealing yellow’). This step allows the leaf to re-absorb its own aromatics and to ‘breathe’ which develops flavor and aroma. 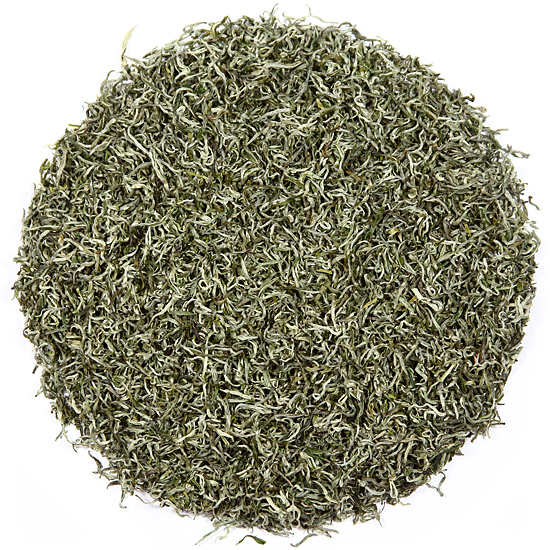 This step allows the buds to reach a greater level of sweetness and fragrance than green tea has. When the tea is finished, the color of the buds have a yellowish color cast rather than the rich green-green color of most green teas. We rarely have the opportunity to offer two versions of Mengding Shan Huang Ya to our taste enthusiasts, but this season we are blessed. 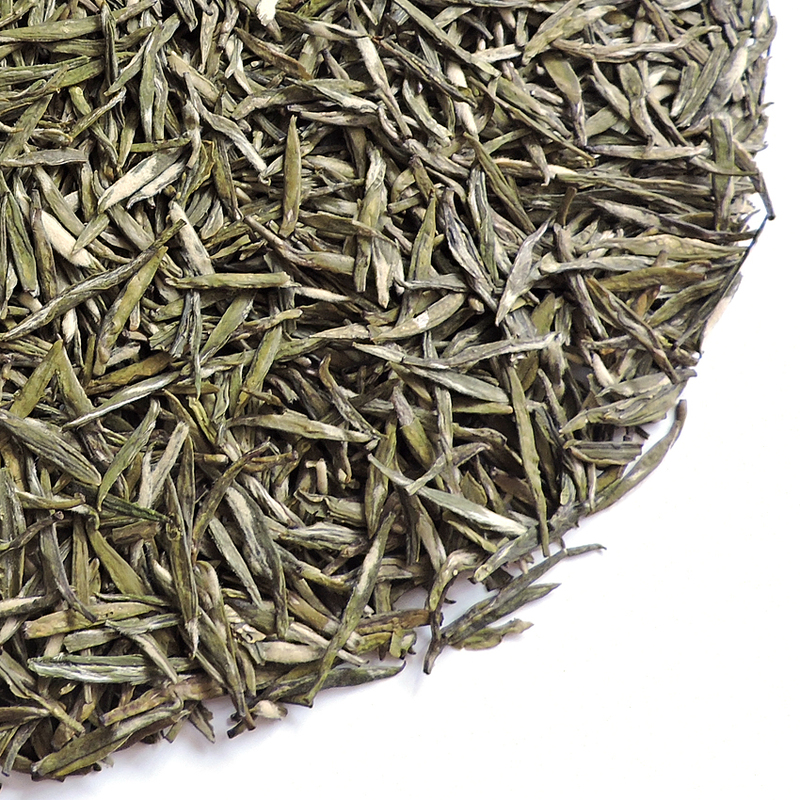 This famous and delicious budset tea is often called “Snow Buds” due to the fact that the buds emerge so early in the season. Because of this, only certain cultivars are able to produce as early as required for there to be any marketable volume of this tea. The two versions that we have this season are both reminiscent of ones that we have offered in the past, they are just different. This one, Shipment B, is a slightly darker color and has a more rustic look to it. The junction point of the bud and stem is pronounced and the curve at which point the the bud will emerge is at least more obvious, and on many budsets is already starting to ‘splay’, even though the overall size of the budset is tiny. The budsets reflect their pan-firing more, and the taste is slightly more nutty and sweet. This tea is actually reminiscent of Bamboo Tips, a very expensive and highly sought after early green also from Sichuan Province, which we normally do not offer. The general description for Snow Buds, which follows, is accurate with the few edits that we have made from our second ‘original’ listing. This is a very elegant tea. The overall taste sensation of this tea is mineral-stone, crisp & clean, and a slight nuttiness, with an underlying layer of sweetness. Mengding Mountain Huang Ya (Shipment B) has a cool and bracing quality that affirms its high plateau origins – its magnificent terroir – and expresses the chilly early spring weather during which time the tea bushes on Mengding Mountain first flush with tender new buds. Our batch of 2018 new harvest Mengding Mountain Huang Ya (Shipment B) was gathered in mid-April 2018, considerably later than some other years but well within the ‘normal’ time for this early tea. The weather in Sichuan has not been quite as finicky as it has been in many other places this spring; however, the early leaf just did not have the concentration of flavor that we were hoping for, so we gambled on waiting a bit to try to find that ‘sweet spot’ of the harvest. This would be the point at which this bud-only pluck would still be young, tender, small and fresh, but would also exhibit some adolescent vigor and youthful complexity. Voila, the gods smiled on this high plateau and the budset cooperated to produce a wonderful ‘late’ harvest of delicious bud-only Huang Ya for us. This year’s Mengding Mountain Huang Ya (Shipment B) has a flavor that is well-concentrated, exceptionally fragrant (when steeped, but not the dry buds), stunningly delicious and full of life. 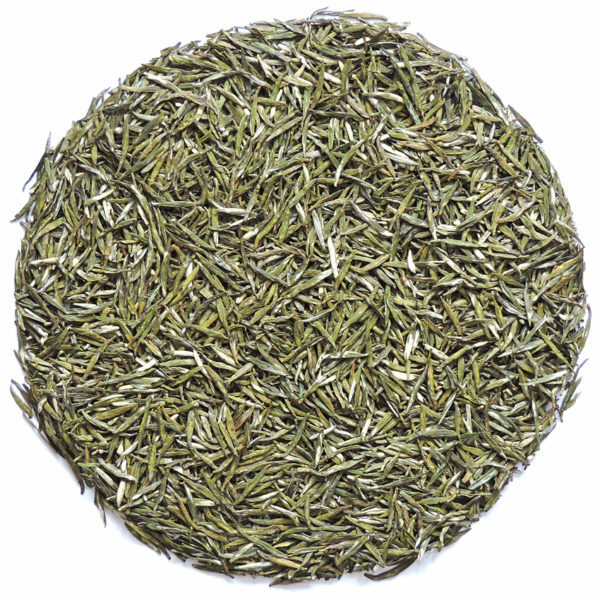 The shape of this tea is precise and lean because there was just enough moisture to plump up the cell structure. (Shipment B) has an earthy, darker color and is flatter in profile, without the slightly tubular shape of our first Huang Ya arrival. The color of both the dry and re-hydrated leaf is outstanding – a green that is quite unusual and that could only be produced in a natural, plant-based material. (Shipment B) has a ‘flash’ of silver to the emerging leaf that the first arrival does not show, which is quite a difference in appearance, actually. This is one of the most beautiful of Chinese teas. Because this tea is so special, we sell out of it every year. We recommend not waiting too long to place your order. We have been able to hold the price at the same as last year – this is very exciting given the world-wide demand for premium tea and the competition that we find ourselves among for special teas such as this. Mengding Mountain Huang Ya is a glorious springtime phenomenon. This tea is made of ‘first-of-the-season’ compact, tender buds brimming with the vigor of tea bushes that are beginning their annual growth cycle. Yellow teas are increasingly uncommon in China because few tea makers specialize in making them today. The extra work involved in making yellow tea makes it more labor-intensive than that for manufacturing green tea and the market for these teas is judged to be dwindling. We are thrilled to have this tea so that our tea enthusiast customers can experience it before the day arrives when it may no longer be made. Mengding Mountain Huang Ya production is small and the season begins early in the unusual micro-climate of Sichuan province. Tea pluckers gather delicate, sword-shaped buds and carefully place them into small silk bags (rather than traditional woven bamboo tea plucking baskets) to avoid any damage to the buds. Two workers picking in this manner for one full day will gather only one kilo of fresh buds. This quantity of fresh ‘leaf’ (actually buds!) may reduce to as little as 500grams of finished tea. Mengding Mountain is located on the Tibetan Plateau in NW Sichuan Province. It is considered by tea historians to be the birthplace of cultivated tea in China. Mengding Mountain is situated northwest of Mt Emei, one of the four sacred mountains in Chinese Buddhism. When we visited a Mengding Mountain Huang Ya tea garden, temple, and tea factory one spring, there was fresh snow on the tea garden from an overnight storm the night before, when we also had arrived. What an experience to walk past the garden’s scolding ‘guard’ monkeys (actually Tibetan Macaques) onto a famous tea mountain in the fog, the tea bushes covered in ice and snow! The garden supervisors lent us lead crampons to navigate the treacherous paths that guided us past those gregarious (and hungry) monkeys to our destination: exquisite and well-hidden, lush tea gardens…dusted with a fresh snowfall. What is Tea Leaf ‘Fuzz’?